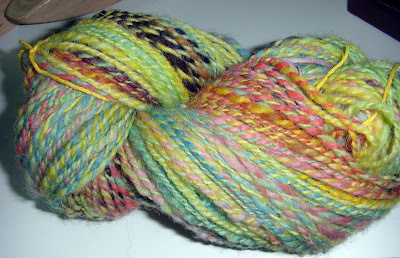 The first thing today, I want to tell you about a prize I won in April. I didn't actually get the prize until May, but that is another story. When I got this prize in the mail I was excited to try it. 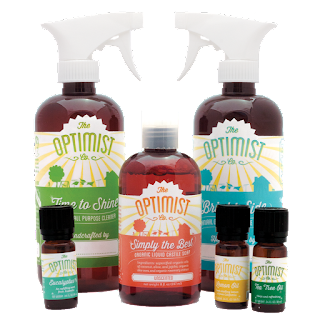 It is The Optimist Co. Make Your Own Cleaning Products kit. It included two reuseable pump spray bottles, an 8 oz organic castile soap, and three 10 ml bottles of pure grade essential oils in Lemon, Tea Tree and Eucalyptus. I needed to add some flat club soda which meant I had to find club soda locally and that took some looking. Then I had to let it go flat. I also needed some white vinegar -but I always have that on hand anyway. I mixed up both bottles using the recommended amounts. Then I did a little cleaning but wasn't impressed. Sunday and Today changed my impression greatly. Sunday I noticed some places on my storm door that needed cleaning. 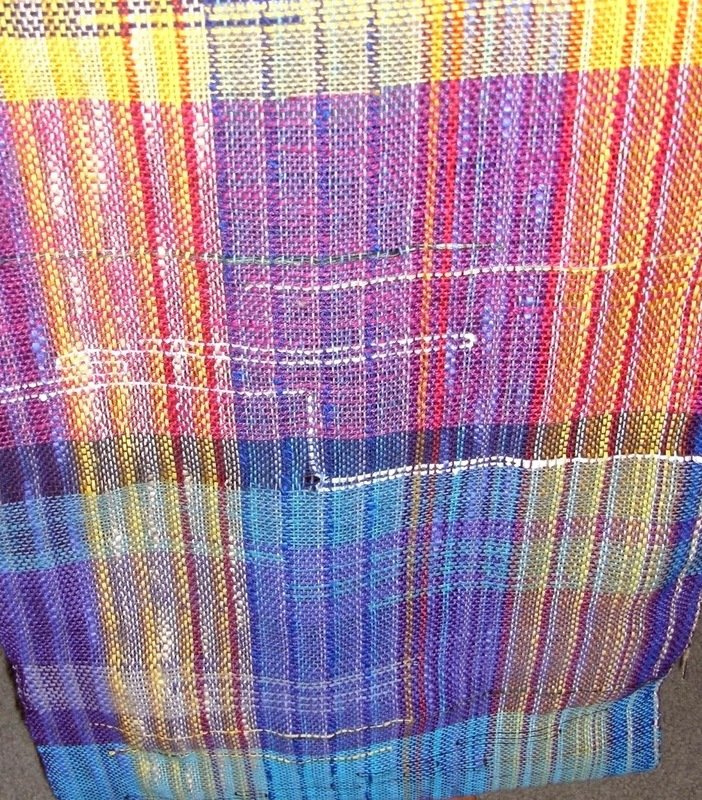 I grabbed the Bright Side glass cleaner I had made and used it. The glass was so shiny in those spots that I had to do the entire glass door. ha ha. Today, I was making a hearty vegetable soup in the crockpot - (this is mostly for my mom since she loves soups and I need to get her to eat more. ) For some reason I moved something on the counter and noticed an ugly spot - water didn't get it off. Hmmmm.... So I pulled out the Time to Shine cleaner and sprayed it. Mmmm..it smells so nice! I started moving more things on the counter and did a good bit of cleaning with the product. Every spot came up and the counter really does shine. I love that the ingredients are all natural and safe. The only thing in there I wouldn't want to put in my mouth is the castile soap. The essential oils in dilution are safe -in fact I use my cinnamon essential oil and my oregano essential oil in cooking. 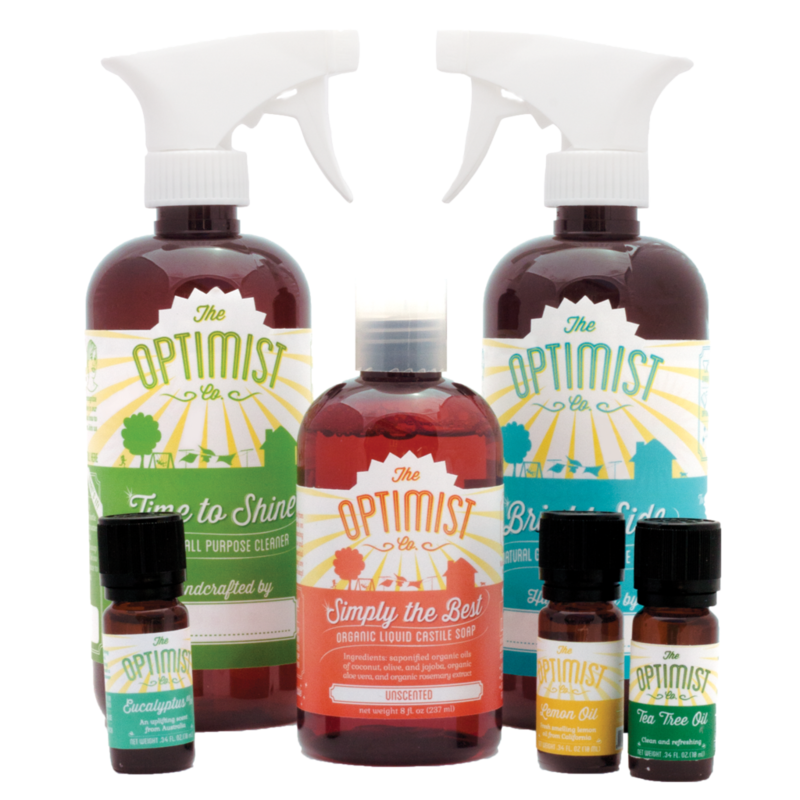 You may want to check out The Optimist Co. I have spun some yarn and done a bit of weaving lately but not much sewing. Here are some of my "results." 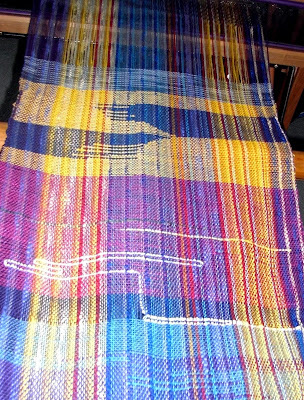 The current warp I made and put on my loom. A couple of friends have named it "Ribbon Candy"
Fabric I am weaving on the current warp on my loom. 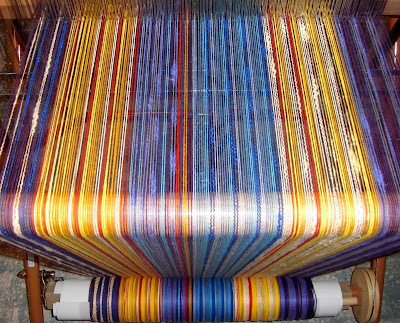 Now back to all the projects I have going - but which one should I be working on now? 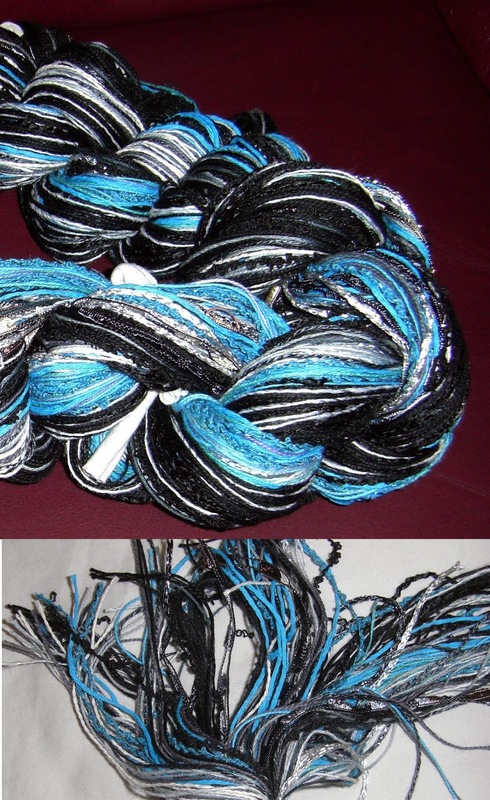 I have thought about trying to make my own cleaning supplies but have never tried it. Looks like this kit makes it easy. I'm off to go check them out. Thanks for the review on the The Optimist Co. 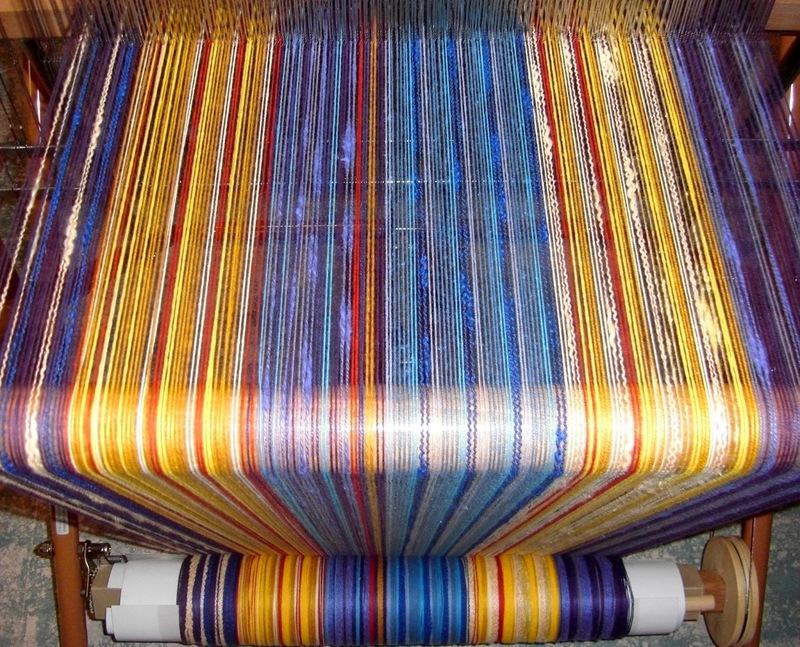 The warp on your loom does look like ribbon candy...very pretty. Check In - in case you missed me.